High or low in the standings, the Detroit Tigers have always been a fighting baseball club. From the time of Watkins’s famous Detroits of the early National League, who in 1887 defeated the St. Louis Browns in a circus fifteen-game World Series, to Steve O’Neill’s Tiger World Champions of 1945, headed by home run king Hank Greenberg, much happened in the early days of Detroit baseball. The most frightening Tiger of them all was the incomparable Ty Cobb, who many argue is the sport’s best player ever. And around Cobb we see the historic cast that won pennants in 1907, 1908, and 1909: Hughie Jennings with his Ee-yah yell from the coaching line, the inimitable Germany Schaefer clowning at second, Walloping Sam Crawford, the great shortstop Donie Bush, dashing George Moriarity, and the pitching titans Smiling Bill Donovan and George Mullin. The Detroit Tigers is filled with anecdotes and intimate glimpses of the players, managers, and owners who throughout the years have made the Tigers one of the most competitive and colorful teams in baseball. 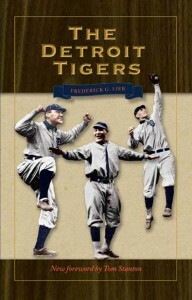 The Tigers have always given the fans a great show—and they give the reader an exciting time in this reprint of Fred Lieb’s The Detroit Tigers. Tom Stanton is the author and editor of several books, including the award-winning The Final Season, a Tigers Stadium memoir, and The Tigers Reader. His most recent book is Ty and the Babe and Hank Aaron and the Home Run That Changed America. He is a journalist and journalism professor whose guest columns have appeared in the New York Times.